Our Association’s president is John Sepulveda, who has over 50 years experience in Kenpo and holds a 10th Degree Black Belt (Senior Master of the Art). Mr. Sepulveda was one of a very few who was a direct student of Senior Grandmaster Parker before his untimely passing. Mr. Sepulveda is featured prominently in Tom Bleecker’s recent book, The Journey and the International Journey, which profiles prominent students of Ed Parker. He is also included in the book “Kenpo Perspectives, The Diversity of American Kenpo” written by Michael Miller. To the uninitiated, this is a singular honor. Mr. Sepulveda has actively and successfully competed in many Open, National and International tournaments and has many junior and senior students who have also competed successfully at the same levels of competition. His students are known for their speed and explosive power as well as their character. 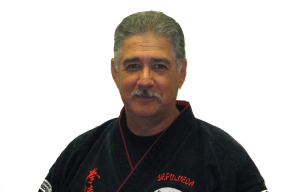 Mr. Sepulveda has also appeared on television, and in national and international martial arts magazines, and has written numerous articles on the art of Kenpo as perpetuated by Senior Grandmaster Ed Parker. Mr. Sepulveda is the founder of the “Advanced Kenpo Training System”™. This organization boasts member schools in the United States, from coast to coast. We are proudly affiliated with Ed Downey’s European Kenpo Karate Association at http://www.europeankenpo.com.